Due to their reputation for benchmark-setting capability, stupid people sometimes push their Jeeps too far. Unfortunately, this oftentimes winds up making the rest of us Jeepers look bad. 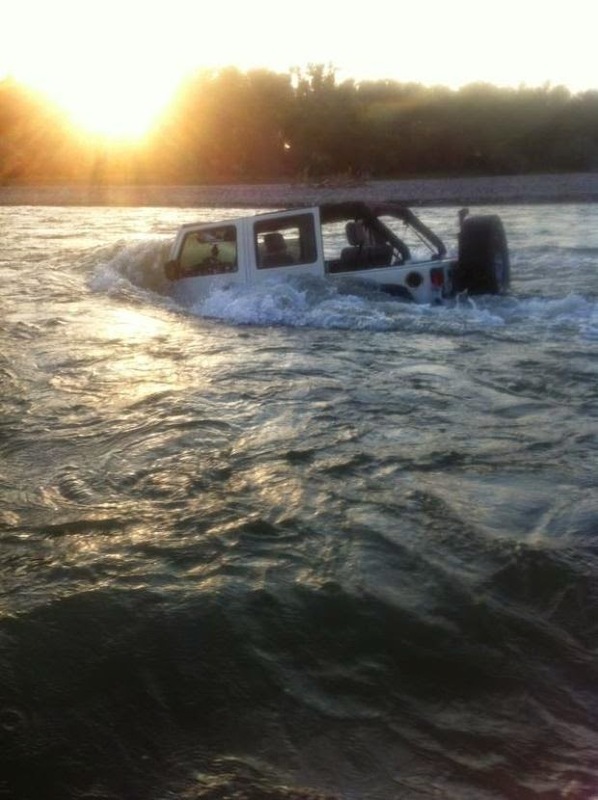 This recent story about a Jeep owner who drove into Montana's Yellowstone River is one such incident. 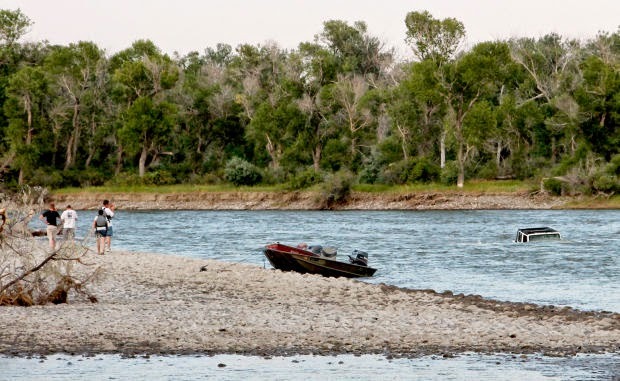 Four people had to be rescued from a sandbar by a Yellowstone County Sheriff Department’s boat after their Jeep Rubicon floated away from the Buffalo Mirage Fishing Access Site on Sunday around 7 p.m.
Three men and a woman were in the car. A 26-year-old man was driving when the vehicle went past the high-water mark, according to Deputy Dave Muhlbeier. The Jeep began to sink and started to fill with water. The sheriff’s boat picked the four up on the sandbar. The other people in the car were a 21-year-old woman and 22- and 24-year-old men. The sandbar is about 1,000 yards down from the fishing access site, also known as Sportsman’s Park. The car is still in the river, and Muhlbeier said it is the driver’s responsibility to remove the vehicle. He also said Fish, Wildlife and Parks may issue a citation to the driver for driving below the high-water line. 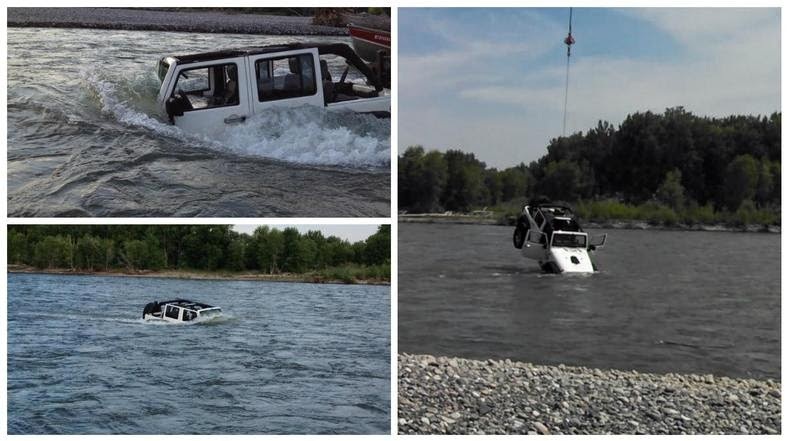 BILLINGS -- The 2010 Jeep Rubicon that was driven into the Yellowstone River at Sportsman's Park on Sunday has been removed, but it didn't come cheap. State game warden Kevin Holland said Tuesday that the Jeep was removed by the Billings Flying Service. The Jeep was secured by its roll bar and the doors were left open to drain water as it was lifted by a helicopter out of the river. Billings Flying Service flew it to a neighboring field where a wrecker removed the waterlogged and destroyed Jeep. 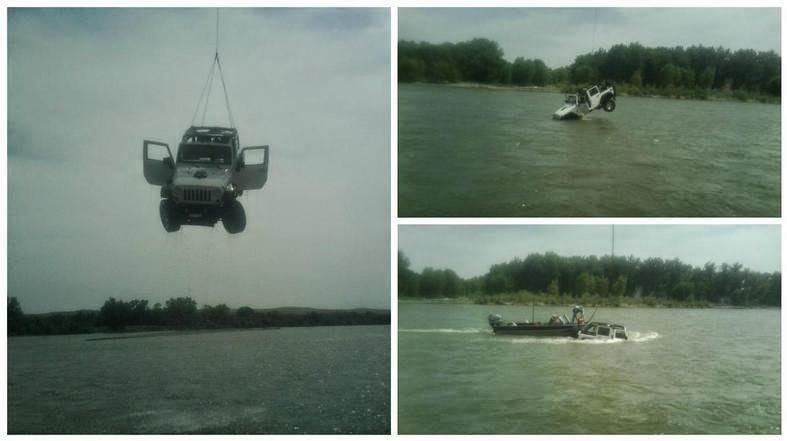 Holland would not divulge the amount it cost the vehicle's owner to get the Jeep removed from the river, but he did say it cost "thousands" for the helicopter service. Gary Blain, co-owner of the Billings Flying Service, said the total cost was close to $10,000. 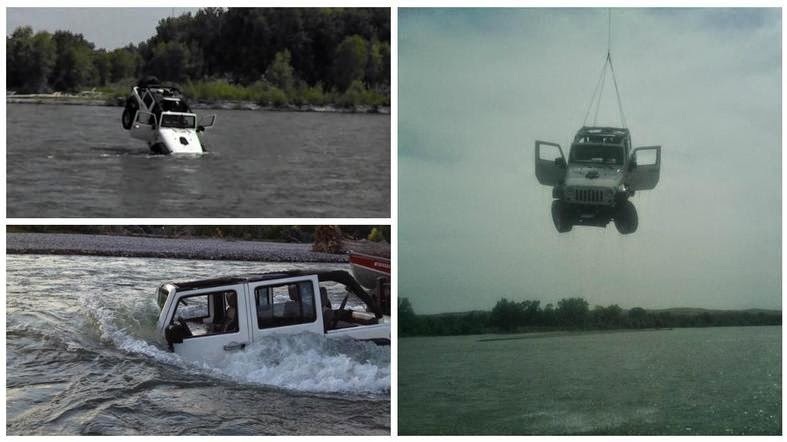 Another co-owner, Al Blain, flew a Sikorsky S-61 helicopter to pull the Jeep out of the river. On top of paying to get the vehicle out of the river, the driver was cited for driving in an unauthorized area, a misdemeanor. The fine amount is up to a judge's discretion, but could be up to $500. Holland said it is illegal to drive a vehicle into a fishing access for recreation other than to launch a boat into the river. Officials said the Jeep went into the river at about 7 p.m. Sunday when three men and one woman were "having fun recreating." 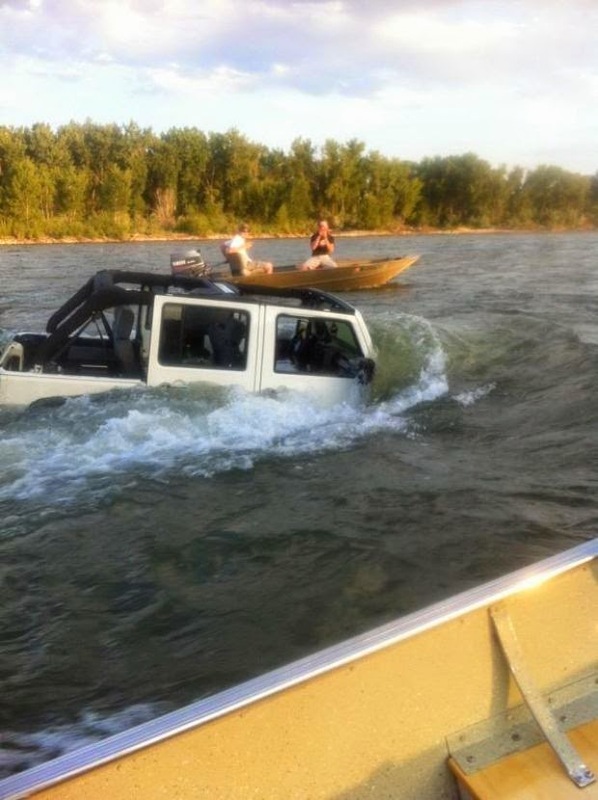 They drove the Jeep past the high-water mark and it was quickly swept away in the current. The four were rescued by boat. 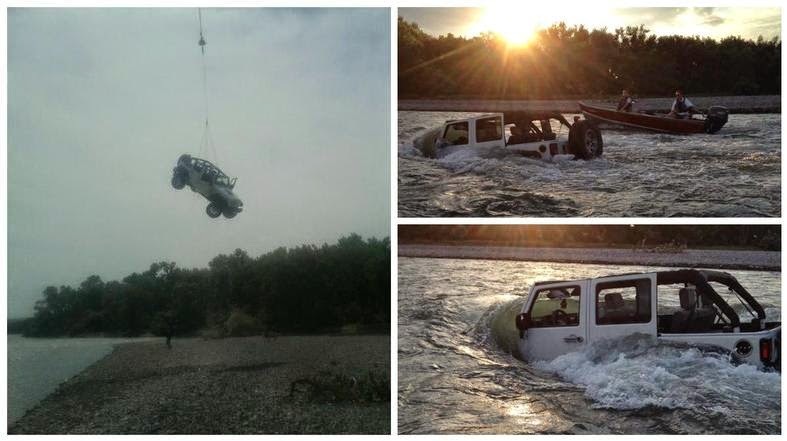 The Jeep was carried a half mile down river. What Number is Your Wrangler?